I recall fond memories of Mansur Johnson, speaking of drawing together the loose ends of our many journeys, exiles, prodigalities, what have you. Back in the mid-sixties, he wrote some prodigious acid poems, i.e. “Blue Monday,” “Ithaca,” and others. They were all gathered under the title DON’T SEARCH, CELEBRATE! As intoxicating as this dictum was to us “realized” acid heads, the sobriety of Muhammad’s “We have not known Thee as Thou shouldst be known” has proven to be a maturer view. Therefore, let us now CELEBRATE THE SEARCH! –From page 220 in Illuminating the Shadow: The life, love and laughter of a 20th century Sufi, Moineddin Jablonski, Edited by Neil Douglas-Klotz, Sufi Ruhaniat International, San Francisco, 2016. How could I resist Moineddin's inducement to publish? But wait, DON'T SEARCH, CELEBRATE! is only 43 pages of psychedelic poems from the 1960s. That's too small a book to publish. And if it isn't well received? I'll never publish more poems. What about the rest of my poems? Life is short. Why not offer all of them? OK.
You have in your hand: Don't Search, Celebrate! 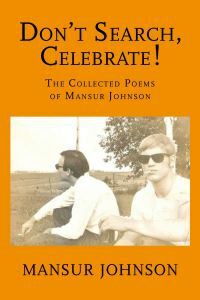 The Collected Poems of Mansur Johnson, 278 pages. "Delicious!" raved Najat Roberts, Moineddin's former secretary. Thank you, Najat. There are 8 sections in this book, including: Don’t Search, Celebrate! (1964), Sacred and Profane Poetry (1969-70), Poems from Mutu Kubla Anta Mutu, Die before Death (1974), Journal Poems (1976), 12 Wild Horses on the Road to New Mexico (1996), Poems from The Passionate Shepherd to his Love and Her Responses (Somewhere in time), The Heart is an Ocean from Murshid (2006), This is It (to the present 2016).